Herbert Hayward was born in Geelong in 1896, a son of James Hayward and Ellen Watts. The family moved to Casterton, living in Racecourse Road and Herbert attended Casterton State School. When Herbert was around seventeen, he started working as a telephonist at the Casterton Post Office. He was a member of the YMCA and attended the Casterton Wesley Church. He trained with the local Senior Cadets and later the Citizens’ Forces. On 21 April 1915, Herbert’s older brother Edward enlisted. Herbert was just eighteen and six months at the time but only four months later he too enlisted on 6 August. Enlisting in Melbourne, Herbert went straight into camp at Albert Park. He was there until 12 September when he went to signals school at the Broadmeadows Camp. Herbert was only there a couple of days when on a training march, he collapsed near the entrance to the camp. He was taken to the Alfred Hospital and died there on 15 September from epidemic cerebrospinal meningitis. On the same day, Herbert’s brother Edward left Australia with the 8th Battalion, 8th Reinforcements. 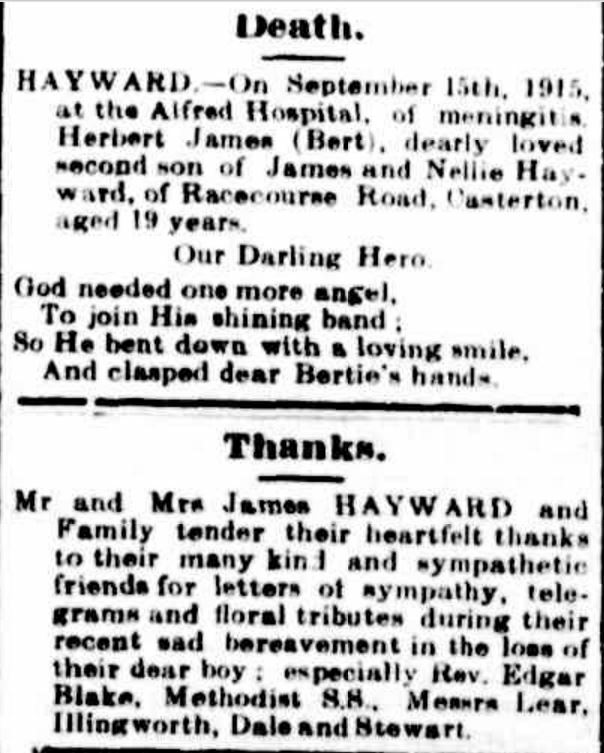 Herbert’s body was returned to Casterton and he was buried there on 18 September 1915. A memorial service was held at the Casterton Wesley church on Sunday 19 September. A tree was planted for Hebert Hayward along Hamilton’s Anzac Avenue.